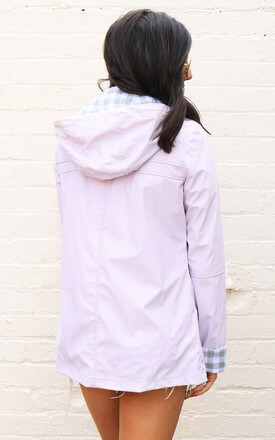 Matte finish anorak in dusky lilac pink. Contrast detailing with chunky white zip side pockets, zip closing and placket with poppers. Grey & white gingham check lined sleeves and cuffs which can be left up or folded down. Hooded style. Regular relaxed fit. 100% Polyester with 100% Polyurethane coating Body lining:100% Polyester, Sleeve Lining: 100% Cotton. Model is 5' 7" and wears a size UK8. 100% Polyester with 100% Polyurethane coating Body lining:100% Polyester, Sleeve Lining: 100% Cotton.